Naval and air power was crucial to the United Nations' success in the Korean War as it sought to negate the overwhelming Chinese advantage in manpower. In what became known as the "long hard slog", naval aviators sought to slow and cut off Communist forces and support troops on the ground. USS Leyte (CV-32) operated off Korea in the Sea of Japan for a record 93 continuous days to support the Marines in their epic retreat out of North Korea and was crucial in the battles of the spring and summer of 1951 in which the UN forces again battled to the 38th Parallel. All of this was accomplished with a force that was in the midst of change, as jet aircraft altered the entire nature of naval aviation. 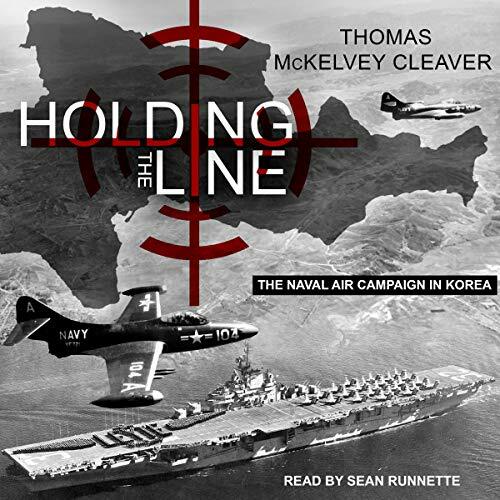 Holding the Line chronicles the carrier war in Korea from the first day of the war to the last, focusing on frontline combat while also describing the technical development of aircraft and shipboard operations and how these all affected the broader strategic situation on the Korean Peninsula.